Nubby Twiglet has a great blog that I frequent often, and she always has great tips. 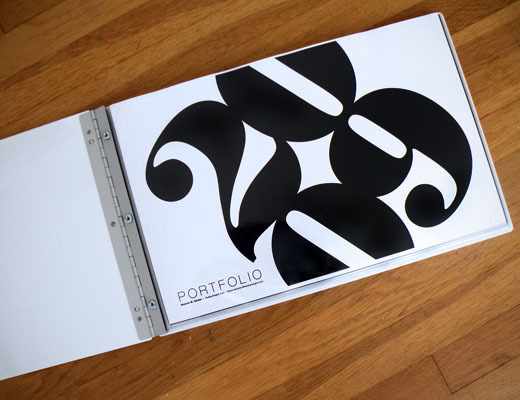 This one focuses on creating a print-based design portfolio, which I am going to be doing over the new several months. I have mulled it over, and decided against a web portfolio in the meantime, and instead focus on my print-based portfolio. My favorite tip: Keep the layouts simple. It’s not so much that I love this post, more that I found it interesting. While I do agree that Sunja Link’s aesthetic is very minimalist, I disagree that creativity has a “look” that everyone should subscribe to. I find it strange that this designer would be singled out as an example of dull Vancouver fashion, because I think that dull means conventional, and Sunja’s clothes are so minimalist that they are definitely not conventional, and therefore not dull. And when looking at the styling of the shoot, it is obvious that it was made to look minimal and reflect a certain mood. That’s what they do in fashion, isn’t it? It’s up to the creative consumer to make the clothes their own, and to style as they wish with accessories. The designer provides the clothes, helps to evoke a mood. And anyways, minimalist is a statement in itself. Well, this is just my opinion. A comprehensive article from the Georgia Straight that reflects on the relocalization movement. There is so much to be said about this shift going on. This touches on everything from fashion to music to business. This entry was posted on	July 28, 2009 at 10:14 am	and is filed under clickables. It appears you have missed my entire point. It’s not that a certain look must be subscribed to, it’s the fact that minimalism is a sickness that Vancouverites are afflicted with. There are many designers from this city that offer the same look; pieces akin to a waitress uniform. It is quite clear to me that Vancouverites [on the whole] cannot be left to their own styling devices with these types of pieces or we wouldn’t own the laissez faire stereotype we have. My impression of Vancouver fashion is one that is more aligned with yoga wear, fleece, jeans and tshirts moreso than it is with minimalism, that’s all I was trying to say. Vancouver fashion can be quite boring, but it’s all to do with lifestyle, right? They make do with what they’re given, and the reason why Vancouver designers especially seem to be offering the same look is because of the resources offered in this city when it comes to the industry. They don’t make enough to be making demands and big runs at the few factories we do have, so most of the clothing is made by home sewers who have limited resources. And then we have the eco-movement, which has prompted designers to look to the same fabrics, again a limitation in resources. Many of these designers also try to keep costs low, and create their own samples, draft their own designs, and in this regard, can only do so much. (It’s all about the bottom line, and although they could experiment, they find out what sells, and continue along those lines season after season.) I’m sure there is more creativity to be seen, but the city hasn’t been kind to designers in helping to breed that, and there aren’t enough consumers. With demand, comes supply. All I know is it’s definitely not a simple coincidence that all Vancouver designers seem to be offering the same look. But, I do understand what you’re getting at, that Vancouverites generally aren’t “stylists” and therefore must rely on clothing more to be fashionable, and if our designers aren’t providing that, then I guess they’re screwed. So, it’s kind of a strange and ill cycle. I myself kind of like minimalism done right. I’m not a fan of fussiness. But then again, here I am being the typical Vancouverite.